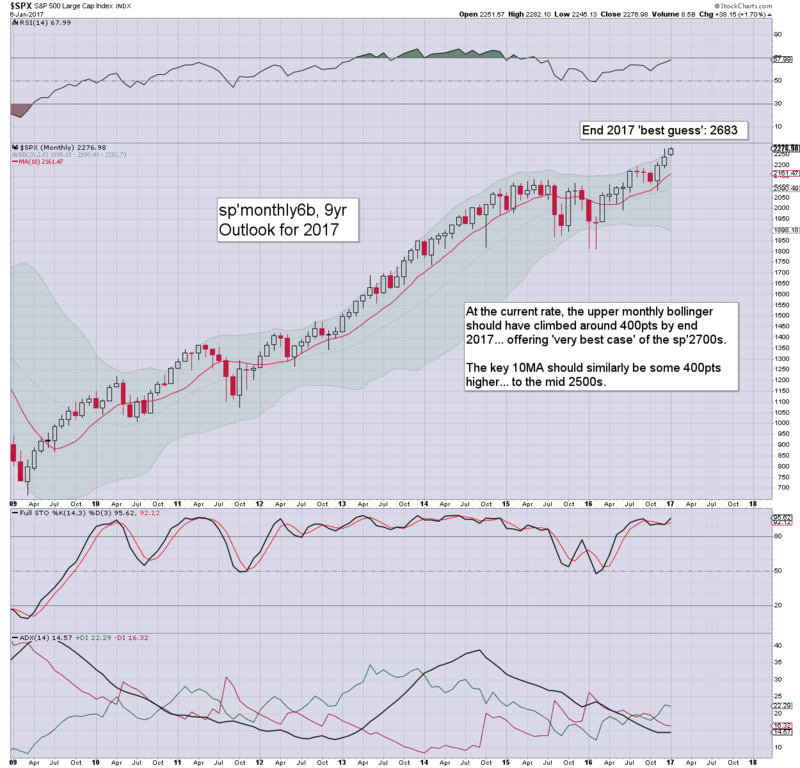 The market has begun the year on an especially bullish note, with new historic highs in the sp'500 and Nasdaq comp'. On balance, 2017 looks set for broad gains, at least to the 2400/500s, with best case of the 2600/700s. - 3 to 4 minor corrections of 4-7%.... but nothing >10%. - broadly climbing at the rate of around 1.5-1.75% a month, aka... 30-35pts. 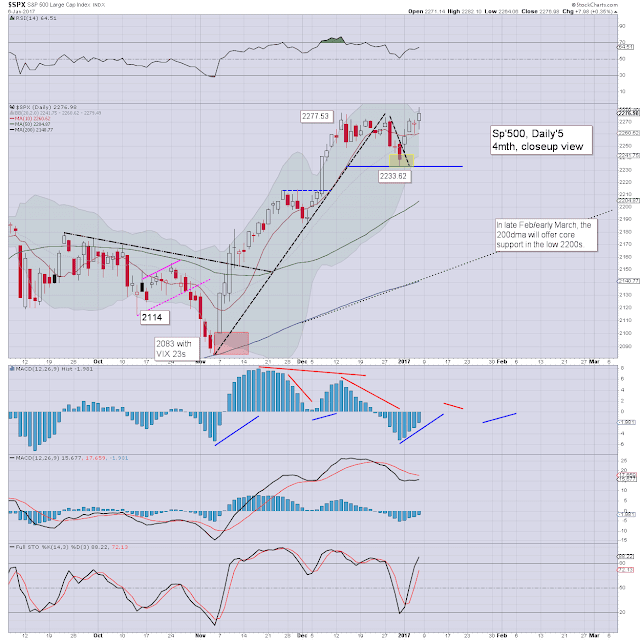 - holding above the key 10MA.. which by end year will be in the 2500s. Earnings/growth. Will the US economy remain in 'ticking along' mode, or will growth start to pick up? There has been a very significant jump in societal/financial sentiment since the Trump victory. How long will the Trump honeymoon last? Inflation. For now, inflation remains very subdued, but there are plenty of commodities - not least WTIC oil and copper, that both look set to climb across the year. If correct, there are very bullish implications for related energy and mining stocks. Rate hikes: I expect THREE hikes (each of 25bps) in 2017, at the FOMC's of May 3rd, Sept' 20th, and Dec'13th. That will take the target range to 1.25-1.50%, and would still be a very low rate of interest. I don't see any reason the US economy - and associated capital markets, not being able to cope. 1800 VTrader: I've been only predicting upside for the last few years but this year I am guessing 1800. The top should likely be a lower high than 2278, though a marginally higher high is possible. From there it should decline into March for the next 47 trading day low which also matches the Hurst 20 week cycle low. Since September 29 2015 each 20 week cycle low has occurred at about 4.5 months, February 11 2016, June 27 2016 and November 4 2016. The next is due in mid to late March. 2550 Greenlander: If this has been consolidation for the last 2 yrs we should get a good pop out of this zone. Also since the vast majority of analysts think we will have a flat/ small up year something different usually happens. Bryan Franco: Bullish Russia, uranium equities, mlps, and usd. Some unusual paired long/short trade ideas: bullish base metals versus emerging asia, Germany versus nasdaq, telecoms versus reits, utilities versus treasuries and yen. Bullish Dow Jones Industrial average versus S&P 500. Regarding equities overall.. I could see a super flash crash this year, maybe 1987-ish, but finish the year -5% to +5%. Why? I could see a lack of a viable equity hedge via the old standby treasuries/gold causing equities to need to get derisked in tandem. Starting this past September, we started to see a positive day-to-day correlation between treasuries/gold and equities.. They were going down together. That puts the big institutions in a very precarious spot. cloudslicer: I think my ability to predict a price target on the S&P is probably less than that of a roulette wheel landing on 00. I look to Dennis Gartman for my contrarian signals. (Yes we went short oil again last week saying 52 was the top). I see US domestic manufacturing and mid-west regional banks as the best buys for 2017. The cabinet picks of the incoming administration look like the Ross Perot dream team. All are fierce critics of free trade, environmental regulation. I also see the possibility of the US ramping up shale production at below cost in order to oil as a weapon against Russia and Iran. Consider that Trump's choice for secretary of state is the ex CEO Exxon mobile. I think US healthcare is the most problematic; we have the double whammy of a biotech bubble and Obamacare defaulting. I think the Eurodollar is finished this year with ouster of Merkel and the Yuan will have to be devalued so the pressure should still stay on the emerging markets. One day though the dollar will top and we will have probably a the buying opportunity of a lifetime in the emerging markets. I see this as an extremely volatile year. **its not too late if you want your target/comments added here.. just email me, or message via Disqus. My target of 2185 was not too far off from the 2016 settlement of 2238. Closest of the submissions: VTrader - 2275... just 37pts above. Very impressive, and that does mean Vtrader's target for end 2017 merits serious consideration. I can't blame some for expecting very sig' downside last year. Even yours truly was looking for broad weakness to the 1600/1550 zone, before a latter year rebound to new historic highs. The reality of course... an early floor of 1810 in February, and then battling broadly higher, with two key lows around the events of BREXIT and the Nov' US election. There are a few bits and pieces of econ-data in the week ahead. However, far more important... earnings from the financial sector, which will start to pour in on Friday... with BAC, JPM, BLK, PNC, and WFC. If those come in at least 'reasonable', the Dow should be trading well above 20k. F - PPI, retail sales, bus' invent', consumer sent'. *there are a rather large number of fed officials on the loose next week, notably Bullard and Yellen on Thursday. The market is CLOSED on Mon' Jan'16th for MLK day. The Friday Jan'13th session will thus be inclined to be very subdued, especially once the econ-data and corp' earnings are out of the way in early morning. US equity indexes closed moderately mixed, sp +7pts @ 2276 (new historic high 2282). The two leaders - Trans/R2K, settled +0.6% and -0.3% respectively. VIX settled -3.0% @ 11.32. Near term outlook offers a little weakness, but broadly... the market remains super strong. 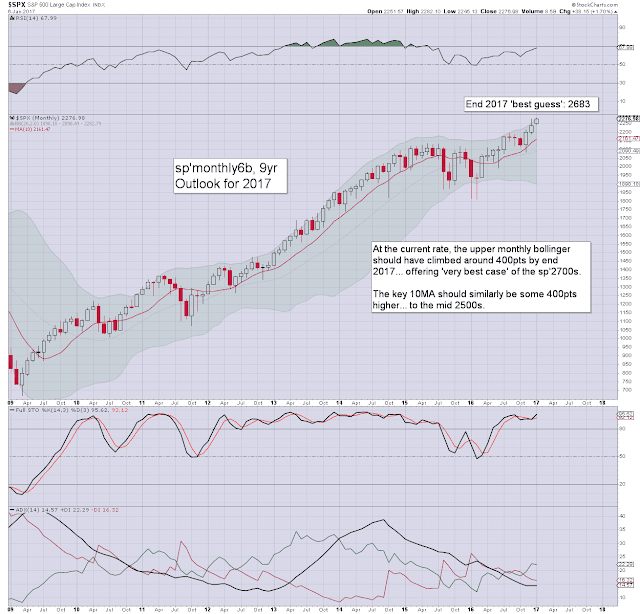 The week concluded with a pair of new historic highs.. with sp'2282 and Nasdaq comp'5536. On any basis... such new highs remain the ultimate bullish signal. 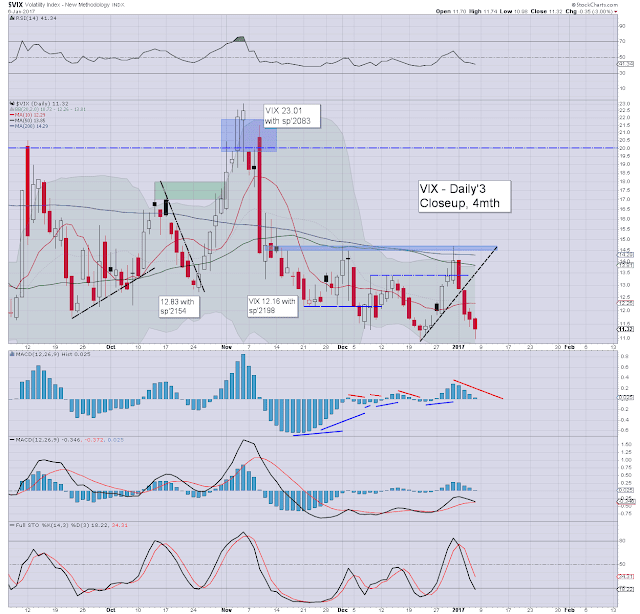 VIX cooled for a fourth consecutive day, as Mr Market remains very comfortable, and rather confident of the year ahead. For now, the key 20 threshold looks as out of range as it has since the Trump victory. *The weekend post will appear Sat' @ 12pm.